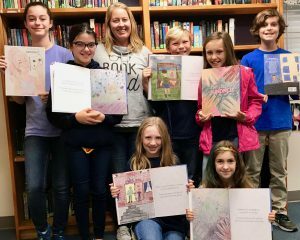 Seven WAAS students (Lillie Nichols, Owen Boswell, Cynthia Worrell, Raegan Sharpe, Ella Carroll, Lawson Kievit, and Grace McNamara) recently had their artwork selected to be included in either Everyday Kindness or Perfectly Imperfect, two published books by Cori Nevruz. Two of the students, Grace and Lillie, are cover artists! On Saturday, December 1st, from 3pm-5pm, Barnes and Nobles Bookstore at Mayfaire will be hosting a Book Signing for Mrs. Nevruz’s books and her illustrators. Swing by this weekend to support these WAAS students and perhaps pick up an autographed book! These books are also available on Amazon.